New golf champion brags his shoes after winning major domestic title. September. 06, 2018 08:06. by Jong-Seok Kim kjs0123@donga.com. Professional golfer Kim Tae-woo has attributed his first championship of the Korea Professional Golf Association (KPGA) since his debut three years ago to his new pair of golf shoes with a big smile on his face. Kim won the championship of the DGB Financial Group Daegu Gyeongbuk Open at the Palmyhills Country Club (par 72) in Chilgok, North Gyeongsang Province, at 15-under par on Sunday. Since grabbing the rookie-of-the-year award in the 2016 KPGA Tours, he had never reached the top position in 41 championships he played in until the latest title. Having changed his golf shoes just before the Daegu Gyeongbuk Open which began on August 30, he finally lifted his championship trophy. His new shoes are the TOUR-S Dual Boa, which FJ released in the Korean market for the first time in the world. The products allow wearers to wind the stretch-free lace into the spool to tighten or loosen the fit of the shoe by turning the two Boa dials. The company developed the products by reflecting various suggestions from Korean golfers. “I decided to change my shoes right after testing them for practice rounds,” Kim said. “They opened a whole new world to me.” He added that the Boa dials placed on the front and back of the shoes gave him peace of mind. 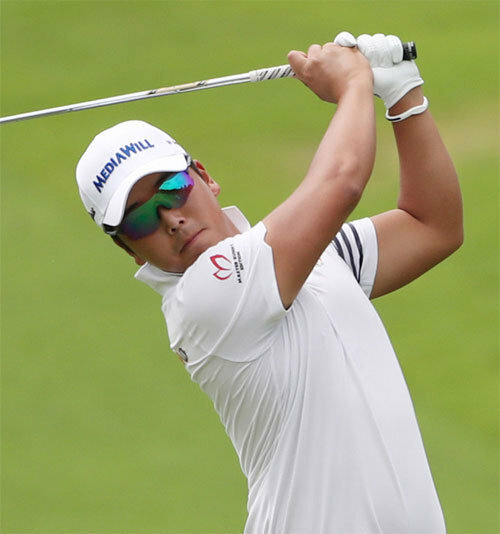 Kim was selected as a member of the South Korean national golf team after changing his first name from Hyo-seok to Tae-woo on her mother’s recommendation in 2012. He now aims to win the Shinhan Donggae Open, a domestic major championship which opens next Thursday. Noting that he first made his name known by finishing second at the championship in his early days, he said he wanted to do it again through the upcoming one.